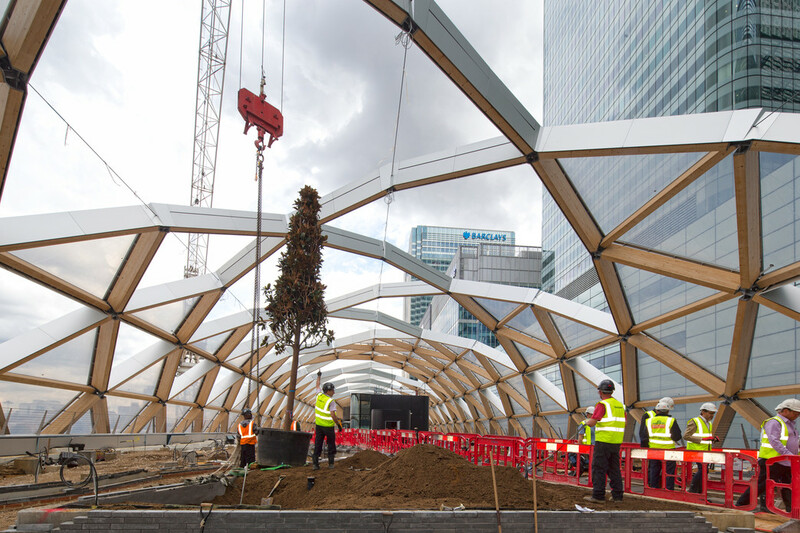 Areas along the Crossrail route continue to evolve as work advances at both stations and development sites nearby. Starting at Abbey Wood, construction is ongoing with much track work in progress between the station and Woolwich. A trip along the line by rail shows numerous orange-clad workers and machinery on the route. 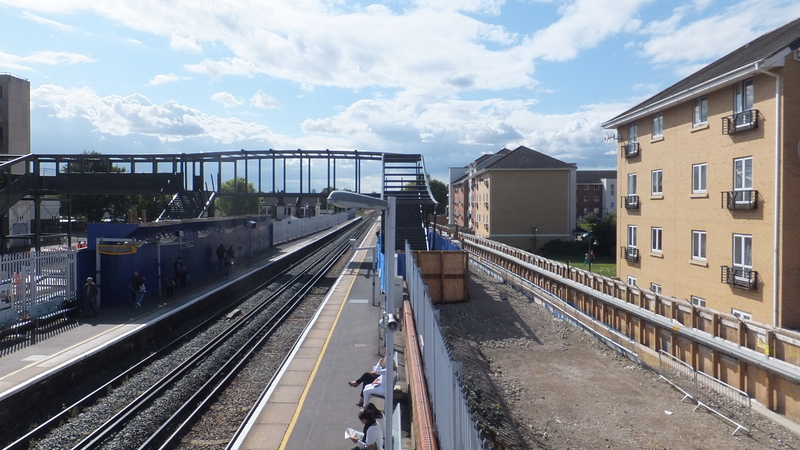 Abbey Wood station has also recently seen the installation of a new bridge at the station. 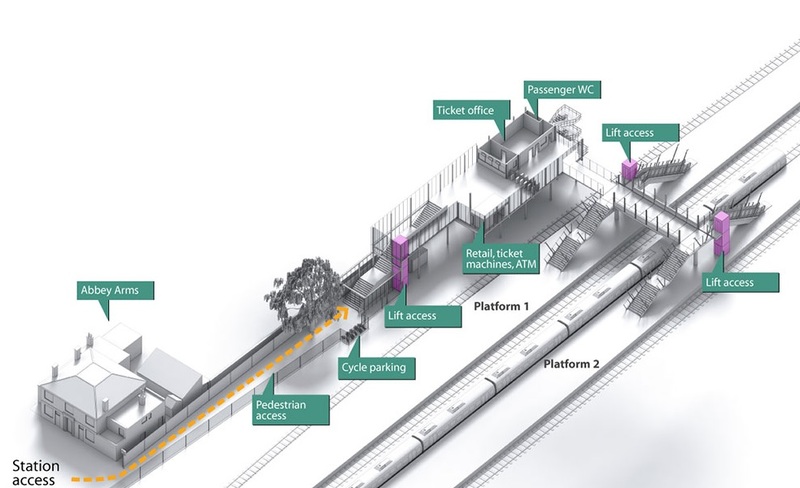 This comprises both the first part of the planned temporary station as well as the the first installment of the permanent station. A Crossrail track heading from central London will go to the right of the platform and bridge, where the land has been cleared. The track on the right side of the existing southeastern lines becomes the Crossrail track heading to central London. 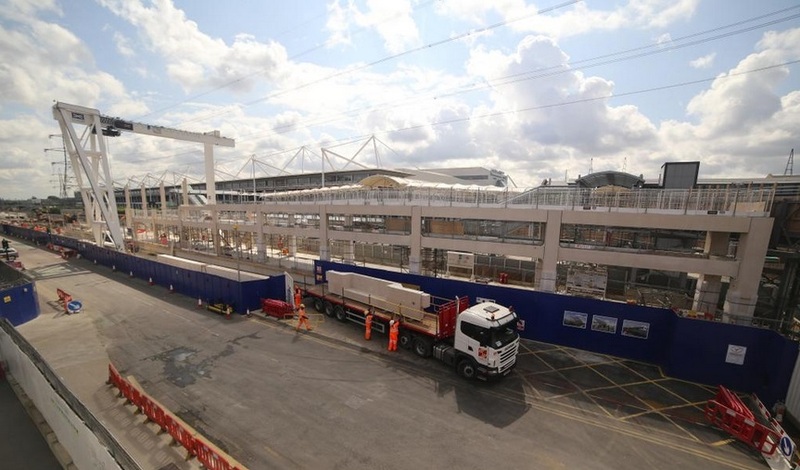 The image below of the temporary station from Network Rail and Crossrail does not seem to match the bridge installed. Plans for the temporary station must have altered. Perhaps the station will be at ground level and not elevated on stilts. Further along the line a new pedestrian footbridge has almost finished at Church Manorway near the Abbey Wood and Plumstead boundary. The final lifting of the main span had to be abandoned recently due to high winds. Work is also now underway for bridge replacement at Bostall Manorway and Mottisfont Road. Once completed the entire stretch between Abbey Wood and Woolwich will be wide enough to move the current tracks (parts already have been) and install Crossrail tracks. Work on the Sainsburys led development of ‘Cross Quarter’ by Abbey Wood station is now well underway, with foundation and piling work ongoing and a large crane assembled on site. Related road works will shortly reduce Harrow Manorway to one direction at a time with temporary traffic lights. 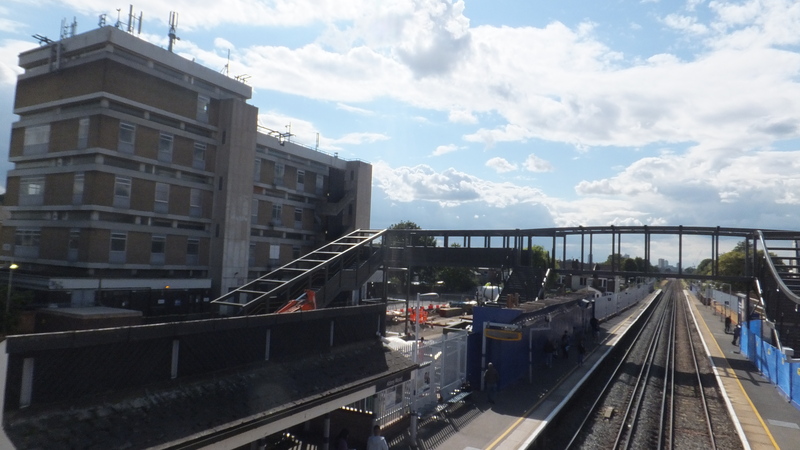 Work on the flyover above Abbey Wood station has also reduced the road to one lane in each direction. These combined Crossrail and Cross Quarter works will mean much more congestion for people heading from Thamesmead in coming months. Main route from Thamesmead. Supermarket on right. I still think Harrow Manorway (shown above) will need to be widened from its current two lane status to four lanes, with a dedicated bus lane in each direction. The road is already quite wide so a great deal of additional space would not be needed. There’s ample space alongside its entire stretch to widen, along with implementing a segregated cycle lane alongside running all the way from the station and supermarket to the pedestrian bridge over Thamesmead’s dual carriageways. This would help buses avoid inevitable future congestion on the way from Thamesmead, as well as make cycling a more enticing option. Harrow Manorway is the major (and only practical) route from Thamesmead to Abbey Wood station and usage will only increase with additional homes planned for Thamesmead. Add in a large new supermarket and housing development facing it at Cross Quarter, and the major Peabody Homes development just off it in Thamesmead and congestion will become severe. The transport assessment for Sainsburys stated that it would bring traffic up to the maximum capacity. That’s before the numerous other developments and Crossrail. 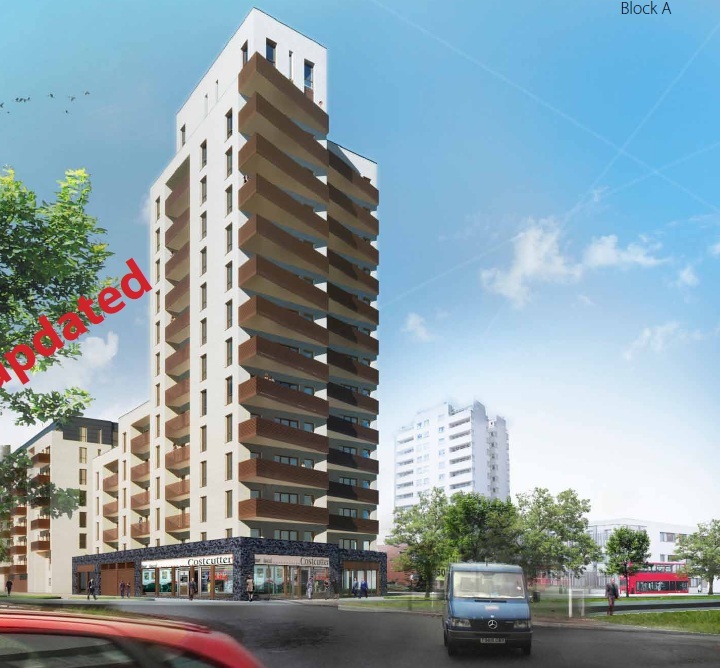 Work on the aforementioned £200m redevelopment of Thamesmead South (formerly Tavy Bridge and now ‘Southmere Village’) has halted whilst new owners Peabody Homes look to alter the scheme. Originally drawn up by Gallions, the plans (see left) were for a tower facing a roundabout and a square behind next to the lake. Gallions had a pretty terrible record with new developments and built some awful stuff across Thamesmead (though those plans looked better), whilst Peabody have constructed some great buildings in recent years and place far more emphasis on quality architecture, so hopefully the re-worked plans will transform the blighted name of Thamesmead. The former Thamesmead new acres library remains standing – a small stump left over whilst all else was demolished in 2013 before plans were halted. I’m not sure why it hasn’t gone like the rest of the site, as even if plans are altered, it is presumably not part of any new scheme. Then again perhaps it will be, and Peabody want to retain part of what made Thamesmead unique. The architecture is interesting and would look great if cleaned up. Without the early modernist stages of Thamesmead, the town is just a bunch of squat Barrett boxes, some terrible 80s and 90s planning, rubbish post-millenial Gallions built dross and an out of town retail park for a town centre, which helped kill off much of the formative attempts at a town centre. So if it is retained it’s not such a bad idea, with some modifications. Construction is also well advanced on the Crossrail train maintenance yard at Plumstead – details can be seen here. This facility hasn’t gained much attention, but is pretty sizable and includes eight lines for stabling trains and three for maintenance trains. 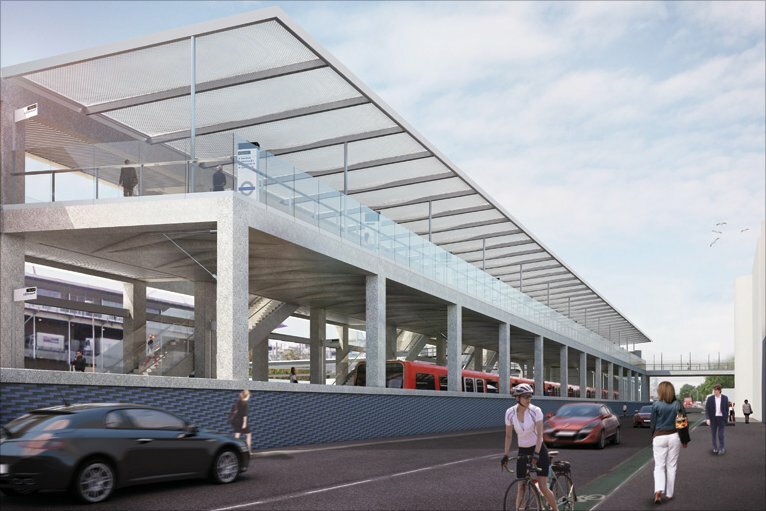 There will be 100 parking spaces for staff and 20 for Crossrail lorries and vans. 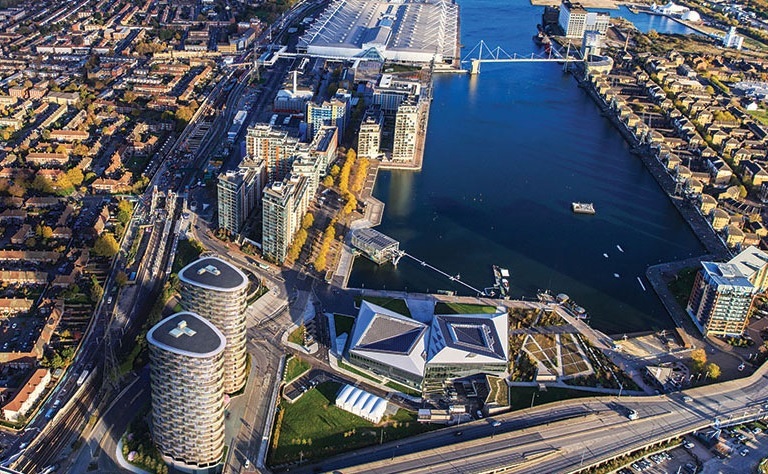 The plans for this facility only came to light after much of the proposals for Crossrail were submitted, and initially registered as being temporary. It is now a permanent facility. It should provide many new jobs locally, and isn’t situated too close to residential areas so hopefully noise will not be an issue. At Woolwich station work continues inside the box to fit out the station with the installation of platforms, track bed, escalators and lifts. Above ground a couple of the Berkeley Homes towers are complete, and the concrete core of another has topped out at about 20 stories high. The completed section looks to be good quality. Heading past that and the Thames tunnels have both been complete for some months now. The Victorian tunnels under the Royal Docks, formally used until 2006 by the line running from north Woolwich and Richmond, have completed refurbishment for Crossrail use. 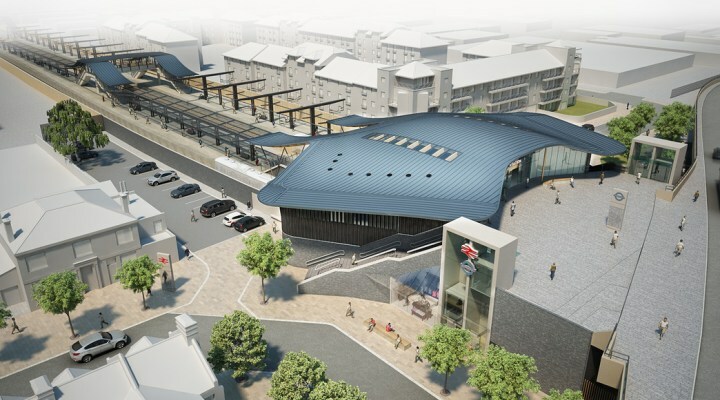 The next station along the line is Custom House, with a render of the completed station on the left. It’s a basic design of prefabricated modular parts shipped and formed on site, located adjacent to Custom House DLR station and close to the Excel centre. The station structure is taking shape pretty quickly at the moment with around a quarter complete. Moving along from the site of Custom House station and work has just finished on one tunnel from Limmo Peninsula to Victoria Dock on the way to Canary Wharf . The second tunnel should be completed soon – It took about 9 weeks to dig the first. Work will be complete by the end of 2014. A couple of moderately tall buildings in a development named ‘Hoola’ have recently secured planning permission close to Custom House station and construction has begun. The last remaining station before the line merges with the north east branch from Shenfield at Stepney is Canary Wharf, which is now externally complete. Work inside on the shopping centre is ongoing and it will open in May 2015. The lattice roof has gaps along the length to allow trees to rise through. As at Woolwich, the station box is seeing platforms, track work, lift, escalator and ticket office work. Much work has now been completed for the entire south east branch. The entire tunneling work for all of Crossrail could well be complete by the end of 2014. Station and track works will then be the main focus. Many proposed developments close to stations on the south east section will continue construction in future which I will report on, along with any new plans that are bound to emerge. Who knows, if Bexley and Greenwich councils get their heads together and come up with a masterplan for Abbey Wood, as strongly urged by Crossrail, we could see some cohesive planning for the many areas nearby that will be redeveloped. Great update and I didn’t know that Plumstead will become a permanent depot. Do we know if the trains leaving the depot can only travel east towards Abbey Wood or will they be able to go directly west toward Woolwich? This will sound rather sad, but I’m actually really excited by Crossrail and the opportunities it will bring to the area. I’m not sure to be honest. from the air it looks pretty tight and like they would only be able to head to Abbey Wood. It ain’t sad at all – it should hopefully shake up SE London and make it a lot better – bringing to the wider area things that the rest of London and other UK cities have enjoyed for years – lots of good pubs, restaurants, cafes, live music etc etc offering real variety. There are some of these but not enough really for an area with so many people. Plus it’ll make it much easier and quicker to get to all the good things in London such as gigs and concerts. There’s lots on in London but almost none of it is in SE London, and it can take an hour or longer to get to at the moment from many places. It’ll be great to see live music in east London and then get a crossrail train home from Whitechapel and be at Woolwich/Abbey Wood in 15 minutes. Without it would we be seeing Abbey Wood getting a good new supermarket, or would Woolwich be a new pub from Antic which hopefully offers good drinks, food etc? Maybe, but Crossrail speeds this up and will hopefully bring a lot more down the line.